We have found through experience that bull markets tend to have quick, sharp pullbacks and then slow grinding moves higher. Is it true for futures in general? Is it true for Equities? Is it true for Bonds? Is it true for Commodities? Is it true for Currencies? My test data set is the free data from CSI available at TradingBlox website. This covers 39 different contracts including a 15 year history of a variety of equities indexes, interest rates, commodities and currency futures. I convert these price series from Panama to Ratio-Adjusted. My objective is to look at each price series at different scales and examine the relationship between up and down moves. 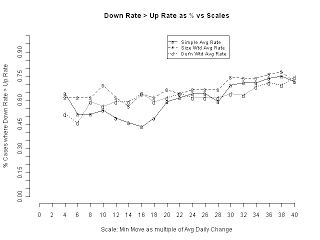 Then I can compare rate of change for up vs down moves at each scale. A ‘move’ is defined as progress in one direction that exceeds a threshold continuously compounded change (i.e. log((End Price)/(Start Price))) uninterrupted by any move in the opposite direction that exceeds the same threshold. On StockCharts this would be similar to the Zig-Zag indicator, except I used continuous compounding to eliminate the zero-bound bias you get with simple percent changes i.e. in my analysis, 100 -> 200 is the same size move up (+69% not +100%) as 100 -> 50 is down (-69% not -50%). If you try to reproduce my results, be aware that you get down moves in excess of -100%. This may seem odd, but the more you think about it the more sense it makes! I compare moves from one asset to another on a uniform basis by scaling everything in terms of the average absolute daily move, log((today’s close)/(yesterday’s close)) for the asset in question over the history available. The ‘scale’ of a move is then simply the multiple applied to the average absolute daily move (ADM). Again, due to self-similarity, this results in ‘moves’ of similar frequency across different assets despite huge differences in % volatility. My test space was 4 – 40 times the ADM in increments of 2. 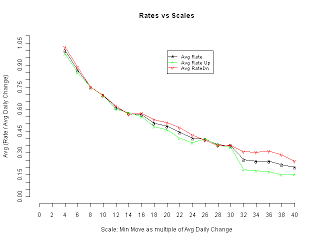 In R, Scales <- seq(4,40,2). Because price series exhibit self-similarity, this approach results in a series of ‘moves’ up and down of similar magnitude (continuously compounded) and duration for a given threshold. Dividing magnitude by duration of each move I calculate the rate of each move – another advantage of using continuous compounding. Further, for each scale, I calculated the average and standard deviation across the set of price series of the net rates, net size-weighted rates and net duration-weighted rates. 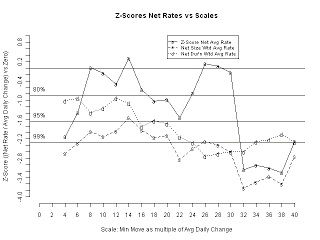 I then calculated a z-score at each scale to test the hypothesis that the sample was drawn from a population with zero mean and the same standard deviation as the sample (SSD). The distribution of the sample means should have a standard deviation of SSD/sqrt(sample size). For large scales, the sample size was not always 39 (the number of contracts) because some samples exhibited less than 1 complete move up and down at that scale. Finally, I did a simple count to calculate at each scale the proportion of price series in which the magnitude of the down rate exceeded the up rate. In general, asset prices decline at significantly faster rates than they climb. The effect seems more pronounced at larger scales of move than at smaller scales. Short, small up moves tend to be relatively fast for a given scale. Short, small down moves tend to be relatively slow for a given scale. The third item may require some explanation: when all the moves are averaged, they do not show much tendency to be different up vs down especially at smaller scales. The difference comes out when the averages are weighted by size or duration. 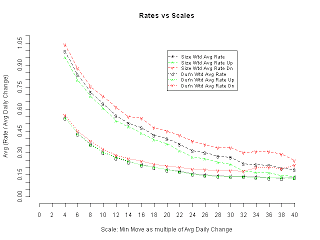 This implies the shorter or smaller up moves at a given scale must be fast (moving the average rate up) and the shorter or smaller down moves must be relatively slow (moving the average rate down). Perhaps this is the footprint of the “bull flag during up moves” and violent short-covering rallies in down moves. I will save the analysis of the different asset classes for another post (too many charts!). So far, it seems that one might certainly require different tuning parameters for up vs down markets. It is not necessarily the case that a different trading style (e.g. MR vs swing) is needed. Investigate the idea in the second last paragraph above as this may suggest something about the trading methodology in up vs down markets. Investigate other characteristics of the moves which may imply the need for different trading system in up vs down such as volatility. Even the best commercially available data contains errors. 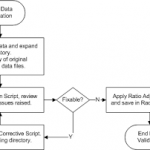 You must have a data validation protocol to help you find and remove them. Remeber your analysis is only as good as your data!